SEPTEMBER 2015 RETAILOBSERVER.COM 17 to allow consumers to more easily clean a variety of dishes, glasses and cutlery. Innovative features include RackMatic ® , an adjustable top rack with multiple levels to accommodate tall glasses or large pots and pans, and additional flip tines that fold down to create space for difficult-to-wash items. A new knife rack provides space for safe cleaning of sharp knives and tools. With class-leading operation top of mind, Bosch has included updated cycles and options into the new Ascenta dishwashers to enhance performance. A cycle called Speed60™ transforms dishes from dirty to dry in about 60 minutes for a fast, convenient clean. For improved drying performance, an Extra Dry option increases the final rinse temperature and activates a longer drying phase to complete the cleaning process. 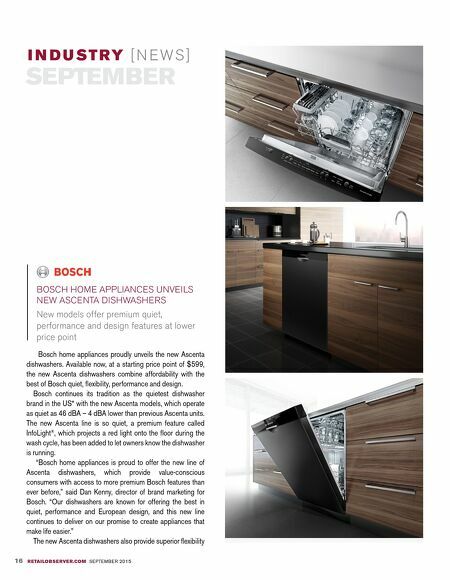 As a leader in modern design, Bosch is introducing a scoop handle into the new Ascenta dishwashers. The handle, which joins the current recessed and bar handle options, matches any kitchen with a neutral design. For added design flexibility, the new Ascenta models are available in three finish options, including: stainless steel, black and white. To learn more about the expanding suite of high quality dishwashers from Bosch home appliances, visit www.Bosch-Home.com/US. BLUESTAR ® UNVEILS NEWLY REDESIGNED PRO-STYLE RNB GAS RANGE SERIES: UNEQUALED CUSTOMIZATION & PERFORMANCE PLUS NEW REFINEMENTS BlueStar ® introduces a new cutting-edge design, with unmatched customization features, for its flagship gas range, the Residential Nova Burner (RNB). The new design – featuring larger oven windows and sleeker lines, as well as BlueStar's legendary commercial-grade performance and a choice of 750 + color and finish combinations – makes the RNB range a perfect choice for pro-style home kitchens. "We are thrilled to introduce this new update to our flagship line. The RNB provides unparalleled professional cooking performance and now a new level of sophistication, featuring a more refined look and unique customization options that will totally transform any kitchen," said Eliza Sheffield, vice president of marketing, BlueStar. TOP PERFORMANCE, FRESH DESIGN The all-new RNB commercial gas range features full width doors and windows, a one-piece control panel and a two-piece body side. A new grease pan design and simplified burners make for easy clean up. The 48" model now includes a window and light in the smaller oven. Handcrafted in Pennsylvania since 1880, each BlueStar product is made by skilled American workers, continuing a 135 year heritage of American craftsmanship. The BlueStar RNB commercial gas stoves also feature wok-ready burners with up to 22,000 BTUs of searing power. The variety of burners, one with high BTUs for fast stir-frying and searing plus a precise simmer burner for low heat, offers the most flexibility for cooking. BlueStar's RNB series is available in 24", 30", 36", 48" and 60" sizes. MORE CHOICES FOR KITCHEN PERSONALIZATION With its distinctive combination of restaurant-grade performance and unrivaled customization options, the BlueStar RNB offers truly unique options for culinary enthusiasts looking to create custom kitchens; it can be tailored to suit any individual style or cooking preference. Endless configurations are available for the RNB range; in addition to the 22,000 BTU burners and 130-degree gentle simmer burners, you can select the layout that works best for you: for example, choose two simmer burners; two 18,000 BTU or all 22,000 BTU burners or any combination in between. The choice is yours because each BlueStar RNB is made-to-order. The RNB series also offers fully integrated griddle, charbroilers and even French Tops. BlueStar also has an unparalleled 750 colors and finishes available on the entire line, providing even more choices for true customization. Virtually any custom color also is possible. To view these endless possibilities, BlueStar offers an interactive website tool entitled, "Build Your Own BlueStar" which allows you to customize a new BlueStar range by choosing everything from the intensity of the burners to the color of the knobs and the color of the range itself. 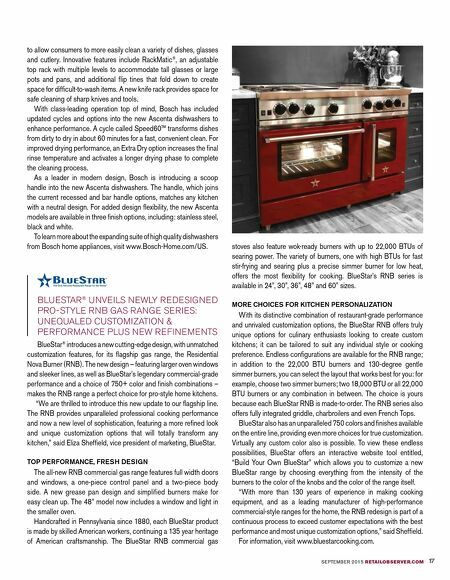 "With more than 130 years of experience in making cooking equipment, and as a leading manufacturer of high-performance commercial-style ranges for the home, the RNB redesign is part of a continuous process to exceed customer expectations with the best performance and most unique customization options," said Sheffield. For information, visit www.bluestarcooking.com.